The marvelously named Francis Godolphin Osbourne Stuart FRPS was born in Braemar, Scotland, later moving to London and then Southampton. A successful published photographer of both portrait and landscape scenes, Stuart sold his images to publications such as guidebooks in London and Southampton and later moved into the business of publishing picture postcards, using the stocks of images he had built up. His work is still in demand today for its evocative depictions of town and country life of the late 19th and early 20th Centuries. Stuart was born on the 2nd of October 1843 in the parish of Crathie and Braemar in Aberdeenshire, the son of a gamekeeper on the Duke of Fife's estate. The 1861 census lists Francis G Stuart, born in Braemar, as living as a lodger in St Nicholas, Aberdeenshire. It gives his occupation as "Assistant Draper (Linen & Woollen)". Is this our Francis? It is impossible to know for sure but it seems likely. From about 1869 Stuart is known to have worked for Aberdeen-based Andrew Adams. Adams owned the 'A. 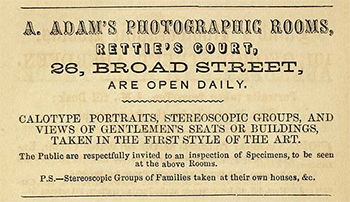 Adams Photographic Rooms' at Rettie's court, 26 Broad Street. Adams business was founded in 1853, making him a very early professional photographer. His work encompassed cartes de visite, cabinet cards, sterograms, landscape and portrait photography, as well as cabinet and camera making. Stuart is listed as living at the same address with the occupation of 'photographer'. Adams himself lived elsewhere. It's possible that Stuart served some kind of apprenticeship prior to 1869. We don't know exactly what role Stuart performed but it is clear that he developed enough of an enthusiasm for photography to set persue it for the rest of his career. He clearly learnt enough to establish himself in business shortly afterwards. In the 1871 census Stuart (misspelled Stewart) can be found at 26 St Nicholas Street Aberdeen. His occupation is listed as "Photographer". His parents and several brothers and sisters (including brother Archibald, also a photographer) were at Geldie Lodge in Craithie. More interestingly Stuart's employer, Andrew Adams and his wife were also present. Why Stuart was not there is not known, perhaps he was looking after the business premises a short distance away on Broad Street. 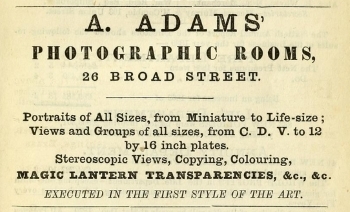 Advert for A. Adams Photographic Rooms, Aberdeen. Stuart is known to have worked here. From Post Office Aberdeen Directory 1859/1860. Advert for A. Adams Photographic Rooms, Aberdeen. Stuart is known to have worked here. From Post Office Aberdeen Directory 1870/1871. 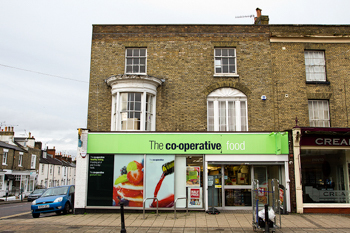 3 Hamlet Terrace, Anerley Road, Upper Norwood 1873-1875. 4 Hamlet Terrace, Anerley Road, Upper Norwood 1875-1881 (now 4 Anerley Road, Penge). 75 St Paul's Churchyard, City of London 1880-1881. He is listed on the 1881 census as a 'Photo Artist', employing 2 men & 1 boy. The rear of a Stuart cabinet card showing the 4 Hamlet Terrace address, dating it between 1875-1880. 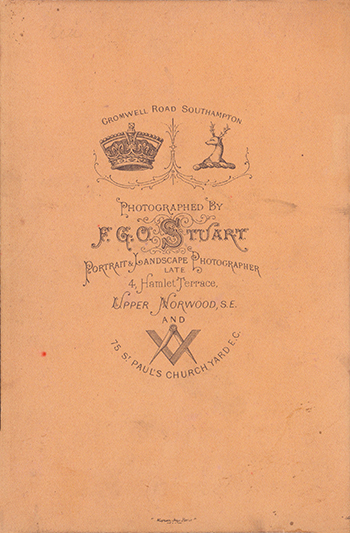 The rear of a Stuart cabinet card showing the 4 Hamlet Terrace address but also the Cromwell Road, Southampton address, dating it after 1880. It looks like old card stocks continued to be used after the move to Southampton with a bit of judicious editing to reflect the address change. 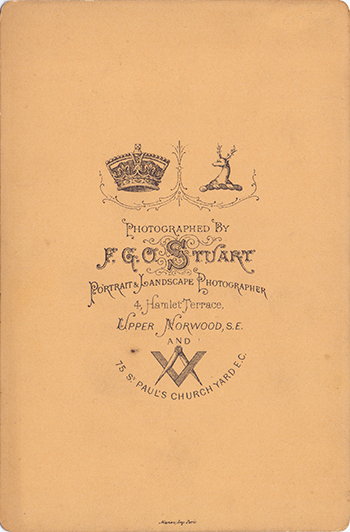 In November 1880 Stuart was elected as a fellow of the Royal Photographic Society and exhibited in their 1880 and 1883 annual exhibitions. It seems that, following his move to Southampton, Stuart lost interest in the society as he does not reappear in their archives. From about 1882, for an unknown reason, Stuart moved to Southampton. In about 1887, after several years at 72 Bedford Place, he established his permanent home and studio at 57-61 Cromwell Road, north of the centre of town. Stuart lived at number 57 and used 61 as his studio. In about 1894 he also took over number 59, which sat between numbers 57 and 61, and used this as a store and the address of the National Photographic Company, which he founded at about the same time. 57 was destroyed during the war, the official bomb map shows a hit in this area and post-war maps show 57 is missing. Today a 1960's house occupies the site. 72 Bedford Place, Southampton - Stuart lived and worked here when he first moved to Southampton. Number 72 is in the middle of this shot. 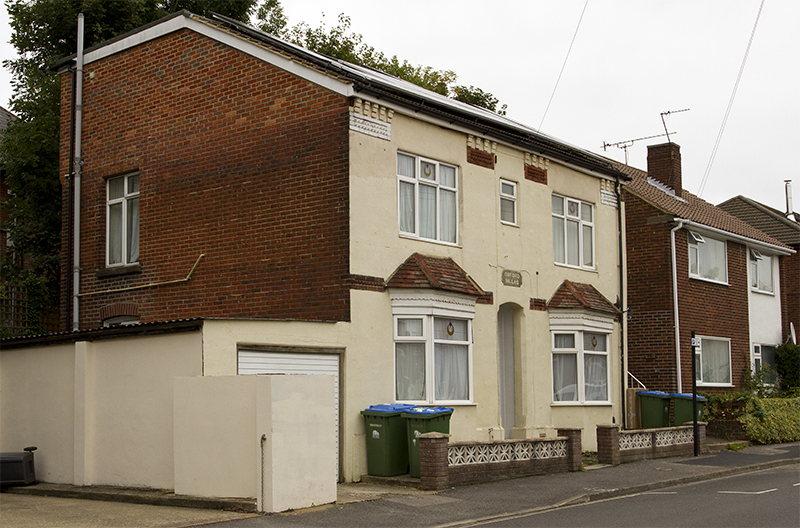 59 Cromwell Road, Southampton - One of three neighbouring buildings Stuart occupied on the road. Stuart used number 59 as a store. 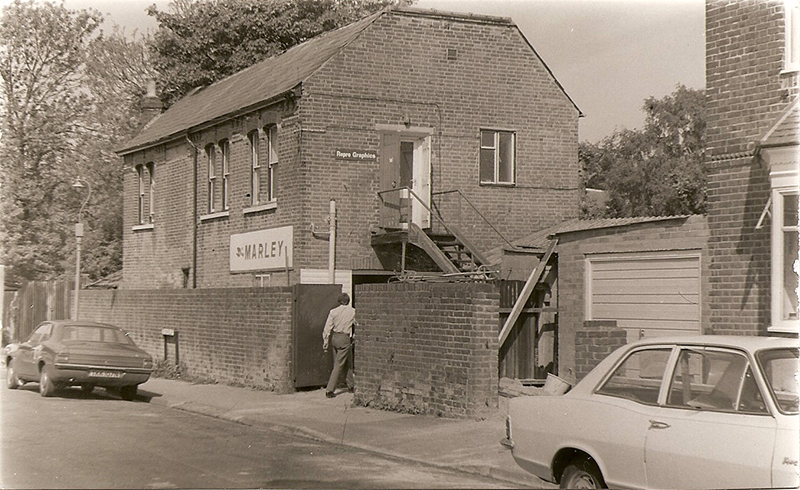 The 1960's building on the right is the replacement for number 57, Stuart's home, which was destroyed during the war. 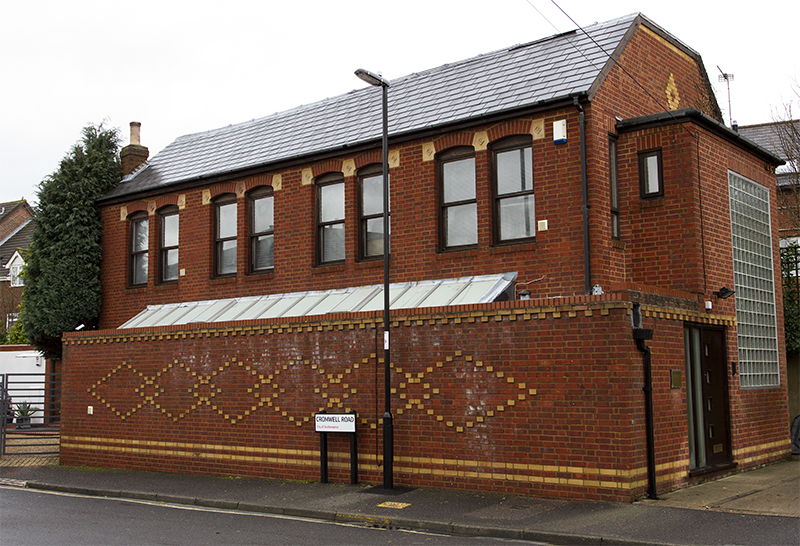 61 Cromwell Road, Southampton - One of three neighbouring buildings Stuart occupied on the road. Stuart used this building as his studio. Today it is home to a firm of chartered surveyors. An older view of 61 Cromwell Road, perhaps from the early 1980's. This shows what the building must have looked like in Stuart's day. It is obvious that it has undergone heavy rennovation since. It was in Southampton that Stuart started to publish postcards from about 1901, using the image library he has built up over the years. The cards were initially printed in Britain by Hudson & Kearns in black and white but from 1903 he turned to Germany, then leading the world in commercial lithography, to produce coloured cards believed to have been printed by the Leipzig firm of C.G Roder. This series continued until about 1911 when, for unknown reasons, Stuart switched to cheaper, inferior printing using unknown German printers. Trimmed cards may be found where the 'Printed in Germany' mark has been removed from the edge, a sign of pre-war stocks being used well into the First World War and beyond. With the advent of war Stuart could obviously no longer use German printers so switched to British sources. The quality of these wartime cards, both of the printing and the stock itself is much lower than the earlier German printed ones. During the First World War Stuart acted as the official government photographer for the port of Southampton, recording damage to shipping. This was impressive given that he was into his seventies by this time. Stuart's original photographs were printed in black and white or sepia but Roder's cards were produced in the colours presumably indicated by Stuart, generally realistic. Altogether, Stuart issued some 2,500 cards, extending from Southampton through Hampshire and several other southern counties, and also military and shipping subjects. Stuart died at his home on the 1st of November 1923 at the age of 80 and is buried in Southampton Old Cemetery on Southampton Common. 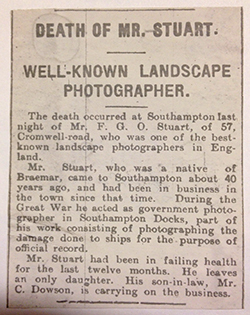 Stuart's obituary notice from the Southern Daily Echo, 2nd November 1923. The family business was continued under the F.G.O. Stuart name into the late 1930s, run by his son-in-law Charles Dowson (whom Stuart's daughter Flora married in 1904). Dowson is listed as living with Stuart by 1911 and as 'Manager' of the business so it is likely that he and Flora had actually been running the business for some time prior to Stuart's death. The 1935-1936 Kelly's directory lists the business but subsequent directories do not. 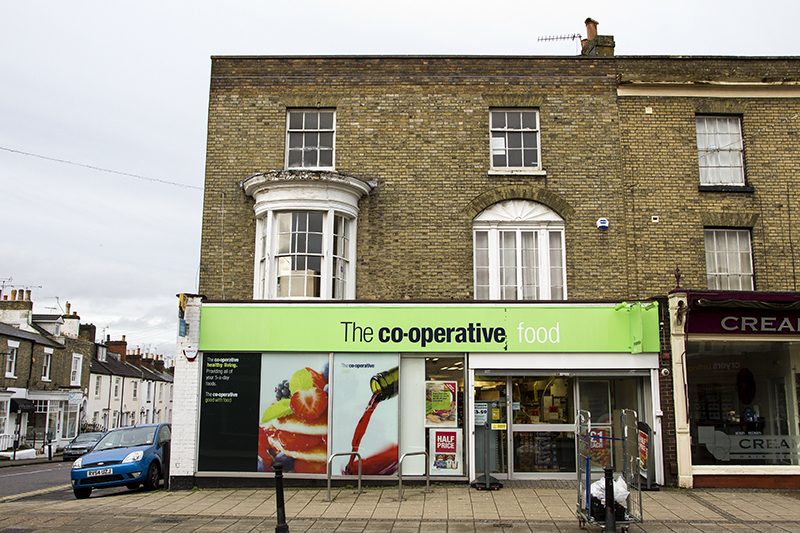 Charles continues as a newsagent at 14 Carlton Place, Southampton until his death in 1946. Most likely the destruction of number 57 during the war, coupled with decline in demand for postcards led to the natural run-down of the business. Flora died in 1957. Cetainly new scenes were added to the Stuart collection following his death. These seem to all be scenes of Southampton and produced in a glossy sepia real photo format. It is not known who the photographer of these images was, perhaps Charles or even Flora. Future census results may give a clue. 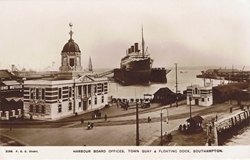 This scene must have been taken after Stuart's death as the Harbour Board offices were built in 1925. It is not known what happened to Stuart's archive of negatives and records. Perhaps some were destroyed during the war, with the bombing of 57 Cromwell Road, although this was nearly 20 years after his death. Perhaps others discarded following the closure of the business. Flora and Charles were childless so there would have been no obvious line of inheritance. Find out more about collecting Stuart's cards.